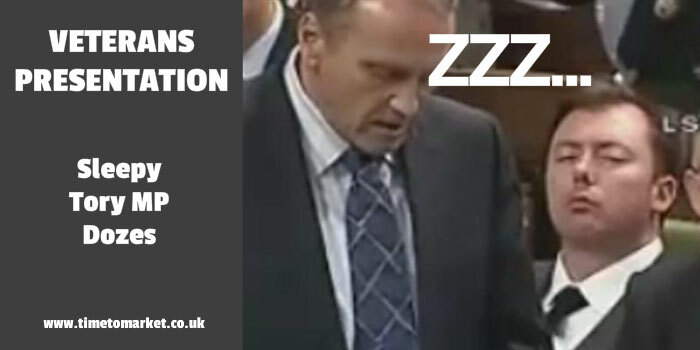 It’s not uncommon for politicians of all parties to fall asleep in public. Some doze off in meetings. Some nod off in Parliament and others just snooze while listening to speeches. Remember that it was Joe Biden who fell asleep during a President Obama budget speech. Faced with their workload and the intensely tedious stuff they have to deal with we might do the same. In fact a survey by SlideRocket noted that some 30% of office workers had witnessed a PowerPoint audience sleep. It’s not unusual. But, in a Veterans presentation? Yes, that was the scene this week. A huge clamour erupted in Canada when Conservative MP Rob Anders from Calgary fell asleep during a Veterans presentation. Quite remarkable. Positively vitriolic would describe the reaction to him falling asleep during the presentation in Halifax, Newfoundland. It doesn’t help Rob Anders that he has form in this area. He was captured before falling asleep during questions in Parliament in 2011. That occasion was televised and spread through YouTube. But his offence this time seems to be that he fell asleep during a presentation concerning homeless veterans. The Veterans presentation, given by the Veterans Emergency Transition Services group at the Commons veterans affairs committee, meeting in Halifax was clearly for a good cause. We helped get 13 vets off the street this year, and that’s what we were talking about. And he’s asleep. I felt like throwing an ice cube at him. I had to stop myself. Mr Rob Anders has denied that he actually fell asleep during the presentation. So what is the truth? Did he find the presentation incredibly dull and boring–despite the plight of the homeless veterans who need support. It’s a possibility. But, the fact that your presentation’s purpose is noble or fundamentally good doesn’t mean you will engage the attention of your audience. You can poorly present even good causes. It’s a pity that Mr Anders fell asleep. But the presenter might also want to look at his technique. The drowsy Tory probably shouldn’t have been roused by an ice cube thrown by the presenter. But he might have stayed awake with a better presentation delivery style, tone or pace. Because the trick is, you want to engage with your audience. When you are ready to give your next presentation, even if you are a veteran presenter, you can always get some help. A half-day presentation skills refresher will top up your skills and confidence levels. Please don’t hesitate to get in touch when the time is right.